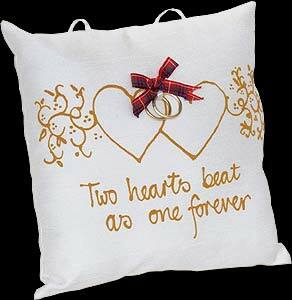 Ideal for Valentine's Day, anniversaries, civil partnerships, engagements, handfasting and weddings. Adornment by Gilli Reeves is a unique brand of beautiful gifts which are based on quotes, sayings and verses to celebrate life's special occasions. Gilli's hand painted pillows are pretty, individually handmade and lovingly hand finished and adorned with beads, buttons, ribbons and roses. For those searching for that personal and thoughtful gift Adornment by Gilli Reeves creations are a must. Material ivory shantung silk, with hanging ribbons 11" x 0.20" / 27.5cm x 0.5cm.